Santa must have ESP or a fibre internet connection. How did he know I wanted to enjoy the festivities with this stunning Smokey wonder on a balmy Christmas evening. And enjoy it I did! The soft pale straw colour through a clear bottle was the first glimpse and was followed by an invisible smoke haze as I splashed the first two fingers into the glass. What is it about Laphroiag that makes it so easily distinguished and desirable. The 10 and QC are favourites and Cairdeas takes this malt to a new level for me. The nose is full of lemon zest and vanilla essence. I catch some young lime then find an unexpected rum and raisin blend, brandied lemon. It's seems young then warms and invites another deep breath. The smoke is just so Laphroiagian-esque-ish? It's reassuring and welcome. On the palate I get Smokey toffee and Christmas fruit mix. This will go well with the cake later. I taste salty driftwood that's been in the ocean for weeks and is now just being lit on a beach fire. There's caramel and a lingering sweetness at the back. I really like this stuff. It adds another dimension to the Laphroaig set but retains the family gene that makes it so good. It's a little smoother and richer that the 10 and has warm maturity over the QC. I wish I had another one on the shelf because this one is disappearing very quickly. Nose is sea air, iodine and butterscotch. Hot, and oily flavours. Rubber. Drop of water and it turns minty. Shoe peppermints. Wishes it was licorice. Simple flavours, soft smoke and then some heat to finish. Interesting but tame. This limited run bottle was released in summer 2012. I was delighted to be lucky enough to get 2 bottles. This bottling combines some of the original liquid used to create the first Cairdeas. It's been further matured and complimented with newer spirit which has been matured in Quarter casks. This is has been non-chill filtered and bottled at cask strength at 51.2%. Unusually for Laphroaig they have used clear glass bottles for this expression. It shows off the pale straw colouring perfectly. The nose is pure Laphroaig. Smokey, peat, salted caramel. It has a butterscotch note found in the Cask Strength Batch 003 but softer. On the palate you get the expected smoke up front. Big, soft and rolling smoke. This is sweeter and much more rounded than the 10, the QC is closer but this is more cunning. It's big, flavourful but smooth and rounded. I wanted to use the word subtle but in the context of a cask strength Laphroaig it seems misplaced. The finish is long, spicy, salty and smokey. It is a wonderful bottle from the distillery that started my Whisky journey. I'm glad I have another as I will be sad when this one ends. @tjb, thanks for your nice review. Really, I like just about everything which Laphroaig puts out. I am sorry that I missed 2012 Caideas last year. I had the chance to buy it even 10% cheaper than your price, but passed on it because the reviews of the previous releases of Caideas were not very good, some quite negative. It doesn't always pay to listen to what other people think...or to expect that the next release will taste like the last one. Likely I will go ahead and buy the next release when I can. @victor, thanks for your kind words. Laphroaig is my first love so maybe I didn't like this as much when I first opened it as I thought it was too muted but it has grown on me. I am a sucker for everything they release. I quite like the Cairdeas series, frankly. They are unmistakably Laphroaig but add a tarty lemon sweetness to the whole proceedings and this particular Cairdeas boasts of similar flavors. The nose is soft with restrained peat and iodine and a touch of sea salt. This is complemented with an interesting combination of red grapefruit, licorice and a drizzle of balsamic vinegar (I thinks that's the sweet and salty). The palate is similar in profile to the Cairdeas Master with a strong pinch of white pepper and cascading honey lemon. The delivery is extremely oily and flows easily over the palate. The minty woody finish with a touch of aniseed is quite generous. Another nice malt from Laphroaig. This is an unusual Laphroaig and I suspect not a terribly successful one. And I mean that only because I hold Laphroaig to very lofty standards. I'm a huge fan of Laphroaig so don't get me wrong. Firstly it's pink. Now I'm not fickle about color but pink is not what I associate with whisky. But let's move on; it's just a minor point. The nose is interesting as it wrestles between it's signature aromas and the new ones that the portwood is forcing on it. There's the nice peat and the familiar meat stew that is quite Laphroaig. However, the iodine is missing and it's replaced by pink melon, red grapefruit, guava and, as my brother pointed out, brown bread. It's not bad but it can be a little confusing. The palate is where I feel it does not deliver to it's full potential. There is first the smoky barbeque with a pinch of turmeric. Then a hastily arranged basket of berries and red plums. It's a muddle really but to be fair it's not disastrous. The medium finish has a touch of oaky mint and spice. I suspect this one will have two camps. The ones who love it and the ones who hate it. And to court controversies from both I have decided to plant my self right in the middle. Love your honesty. That's worth so much to other connosrs, Well done. Thanks @rigmorole - really nothing to hide here. I was looking forward to this one so you can understand my disappointment. I have a bottle of this stashed away so it was nice to share it with a bunch of friends when a friend of mine decided to contribute this gem from Islay. (Fitting that I should have had it the first time with friends since Cairdeas in Gaelic means Friendship). Another un-Laphroaig-ian nose that I have encountered of late. Are they toning their spirits down? I hope not. I mean I love how this one smells. I just hope they don't change their style completely and by that I mean the Quarter Cask, the 10 and the 18. The nose is an instant drop of lovely cashew nuts and mixed dry fruits. Boiled lemon sweets dipped in malt, drizzled with delicate sugar syrup and sprayed with a lovely peaty mist. The nose is delicate yet assertive. Is it too delicate? Well, yes when compare to standard Laphroaigs. But that's just me being too picky. The smooth, oily palate comes tumbling with sugars and crushed lemon rind and melon drops. The late cardamom spices step in to remind you that this is not all child's play. Not as complex as I would have liked but highly likable nonetheless. The long finish is a bit chalky and dries towards the end but I quite like the dry spice and mocha coffee beans its brings along with it. I think this is a wonderfully restrained dram. The only fault I would find is that it did not really let it's hair out on the palate. Would I drink this again? Well, what do you think I'm drinking right now? Which Cairdeas release is this? Judging from your notes I'd guess not 2013, but possibly 2012 Origin. (I've not tried any others so could it be earlier). The default bottling options on this site could do to be updated or clarified; as I know it has been awkward picking the correct category at times when writing reviews - particularly the Cairdeas releases. This one is actually the 2010 Cairdeas Masters Edition. I seem to have gotten the ABV wrong as well. The one I've reviewed is bottled at 57.3% - unfortunately I can't go back and change it. Second part of my review, (part 1 being Laphroaig 10 to provide a benchmark). On the nose at first I get a hint of zesty lemon. The peatiness is more subtle than the 10yo but complements the lemon nicely. Almonds too? 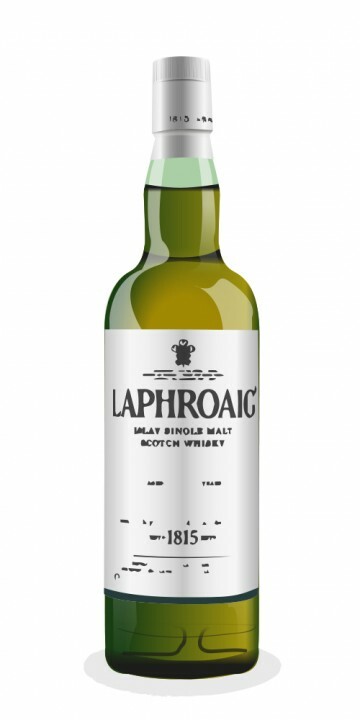 I missed out on a bottle of this from Laphroaig on the day of release. I was gutted and believed that this expression would pass me by. I am delighted and unreasonably excited to have got my hands on some. Unlike any other Laphroaig that I have seen this is has the most amazing pink colour. It looks like pink champagne (of course without the bubbles). This limited edition Laphroaig is initially matured in bourbon casks then finished in Port pipes/casks. As soon as you smell this you know its a Laphroaig. The smoke, iodine and sea spray plus new overlaying fruity waves of orange and lemon plus some darker fruits. It has the punchy nature I expected with a softer fruitier side. Smoke, peat, sweet dark fruits like plums and dates, a twist of orange peel. To me the port finish gives it a sherried quality I associate with many Speysides. I know there is a school of thought to not mix smoke, peat and sherry but to me this works. The finish is a little dry and I love it. It gives me what I expect from Laphroaig with a new dimension. I would like to see them try this again with an older cask and then they will have something truly exceptional. If you can acquire this extremely hard to find bottle, then you are hired as a gold miner in Antarctica. Well done. I manaed to get one in the states, alas, only store pickup - lucky for me my brother was in the neighbourhood... The Laphroaig USA Facebook page was a great help! Friends of Laphroaig and the Ardbeg Committee frequently send out newsletters offering their members 'special' deals on limited bottlings. Normally I look at these and choke on the three-figure sum, (as much as I'd like to buy them). However, when offered this first ever port cask Laphroaig at £47 I jumped at the chance. The question was - do I drink it or wait a couple of years and sell it for three or four times the price? After 10 seconds thought, it got opened! First thing I noticed is the almost luminous pink colour - very weird. A drop of water releases a minty-smoky nose. Quite like Kilchoman really. But there's something else too which I can't quite get - bananas and hay??? Seems mad for a Laphroaig but it could be my imagination running wild. This has a very mellow smokiness on the palate, (this is tasting with water) with a fruitiness that reminds me most of plums. As it opens up further, a chocolatey edge is revealed. I hate limited editions being this good. You know you're never going to get another bottle, (at least without paying super-inflated prices). But then again, if they weren't this good they wouldn't be limited. What a conundrum. Woah! I knew they'd sell out quickly but that quickly is insane, (I admit I bought mine within a couple of hours of the email). Sorry you couldn't get a bottle. I often think about saving rare malts for a bit of money, but then think would a couple of hundred quid really make a massive different to my life over a few years? Or shall I just savour and enjoy something unique? The answer is invariably the latter. Good review, I didn't see the email from Laphroaig until 5pm (it arrived 1030) by which time they had sold out Gutted! Even Master of Malt selling at £89.99 were sold out too. Savour the bottle as it will be hugely expensive when you next see it. I am a huge fan of Laphroaig but won't pay stupid money so will just have I check emails more often. Mind you, I still have my Laphroaig Origin so hopefully will find someone locally who wants to do a sample swap. In my previous post, I reviewed the Macallan 15 Year Old Fine Oak, which I brought to Kingston with my friends Omar and Fab for our boy's weekend. We enjoyed it before we went out for dinner, beer and weird stoned strippers. But when we got back to the hotel (sans strippers), I cracked this puppy open! If I had to choose a #1 favourite distillery, it would be Laphroaig, one of the most pungent, and divisive, of the Islay whiskies. It was founded in 1810, right next to Lagavulin, which has not made it easy for them given their neighbour's stature. They have also retained their own floor maltings, which supply about 1/5 of their needs (in other words, it's for tourists and marketing more than anything else). One of their more successful marketing initiatives is their Friends of Laphroaig program, where you join an online community of fans, and get your own square foot of Islay land (ok sure). The 2012 Cairdeas Origin bottling commemorates 18 years of the program (Cairdeas is gaelic for "friendship"), and various Cairdeas expressions have been around for a few years. This particular one retains some of the whisky from the very first Cairdeas expression (which is now between 13 and 20 years old), and blended 50/50 with 7 year old spirit that has matured in quarter casks. It is non-chill filtered. The colour is a pale golden yellow (which seems unique to this whisky). On the nose you get, of course, sweet peat smoke, but it's not overwhelming. Wet rain slicker, diesel exhaust, iodine (but not a lot), and some orange (yum!) Not as much of an Islay burst as you might think - there is some subtlety here. Is that a very slight hint of Parmesan cheese in the background, or am I nuts? A drop of water brings out some brine. Over time, the nose becomes more muted. Off the top of the palate, you get some malt vinegar (which becomes stronger the longer the whisky sits in the glass), followed by enveloping smoke and white pepper. Salty as well, which water accentuates. With some barley sweetness as well, this is a fantastic flavour. The finish is long and ashy, a slow gentle, slightly damp campfire in your chest. It has power but it holds it in check. This is a perfectly balanced dram, one of the great Laphroaigs in my opinion. I first tasted it at a Laphroaig event in Toronto but I am very glad I have a bottle so I can give this more attention! The wide variety of seemingly disparate flavours makes this an endlessly fascinating and entertaining dram. Omar and Fab loved it even more than that earlier Macallan, and it made the perfect end to a (slightly) debauched weekend - that is, until Fab woke me up with the loudest snoring (besides my ex-wife's) that I've ever heard. Thanks for the nice review. I stared at this one for months on my store shelves but couldn't bring myself to buy it because of many very mixed reviews. I hope to get a taste of it one day...but it is gone from my county for now. Nose: condensed, with relatively subdued peat and smoke. The fireplace is softened by vanilla, sweet barley and hints of marzipan. Lemon and salt as well. Mouth: barbecue, the usual medicinal and peaty notes but everything seems to be covered in a layer of toffee, caramelized almonds and lemon candy. The aftertaste is sweet as well but gets a lot drier after a while. It’s a rich dram but in my opinion a little bit out of focus. The nose is nice but relatively shy, the taste is quite sweet, the finish quite dry. Some say this is one of the best Laphroaigs of the last couple of years. I’m not one of them, I’m afraid.